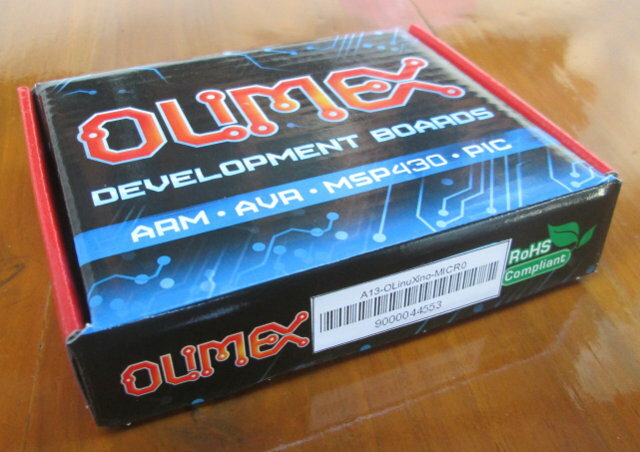 Every Friday, Olimex organizes an online competition where they give away one of their board. They’ll ask a (usually simple) technical question on their twitter account at 22h00 (GMT+7), and all you have to do is to reply to their tweet with the correct answer within one hour. The winner is then selected randomly with random.org. There are usually 50 to 100 respondents so the odds are pretty good. I played a few times, and finally, I was lucky enough to win an A13-OLinuXino-MICRO development board at the beginning of December. I received it yesterday, after UPS took a whooping 15 days to deliver the board (Way to go UPS!). The board can be purchased on Olimex for 35 Euros plus shipping and taxes, or even lower if you order larger quantities. Video Output – VGA video output. LCD signals are available on connector. 3 “GPIO” connectors (2x 40-pin and 1x 10-pin) – Those give access to NAND flash, GPIOs, I2C, UARTs and SDIO2 signals, as well as 5 system pins: +5V, +3.3V, GND, RESET, NMI. LCD Connector – You can connect an optional 7″ LCD provided by Olimex, or connect your own. Misc – 1 reset key, 1 U-boot/FEL key, 2 LEDs, 4 mounting holes, UART1 header and pads for JTAG and UART0. As usual, I will first post some unboxing pictures, then try Linux on the board, and give some kind of review. The board comes in a small Olimex branded package, and as is the case for the Raspberry Pi, the only item in the package is the board. Let’s have a look at the top of the board first, where all the components and connectors are placed. The back of the board shows markings for the GPIO connectors, VGA, UARTs, JTAG and some test points for the different voltages on the board. A13-OLinuXino is larger than the Cubieboard and almost twice as big as the Raspberry Pi. A power supply – A 5V/2A power supply to connect to the 5+ jack or the miniUSB port. A microUSB port might have been preferably since most mobile phones used this type of USB connector. A USB hub – This is optional but since there’s only a USB Host port, it is required unless you only plan to connect one USB device (e.g. USB keyboard). USB to Serial Board – Again, this is optional but it is really useful for debugging purpose in case there’s an issue with the bootloader and/or kernel, or you simply don’t want/need to plug the board to a VGA monitor. One good thing with Olimex is that they have free user’s manuals for their boards. That may seem trivial, but the Cubieboard simply do not have one, and the Raspberry Pi does have one, but you need to pay for it. Of course, all boards have some free resources online, but it’s still nice to have most of what you need in one document. So let’s download A13-OLinuXino-MICRO user’s manual first. It a 30-page PDF document that gives you an overview of the board, explains how to get started with the board, and gives a detailed hardware description of the board (pin and connectors descriptions), some information about AllWinner A13 SoC, and some links to the design files (schematics & PCB layout in PDF and Eagle format). Since the board does not have flash, you need to load a Linux image to a microSD card first. Olimex currently just has a preliminary Debian image for the board (A13_Micro_Debian_first_preliminary_release-06122012.rar – 737 MB). This is a compressed SD card image, so simply uncompress it, and dump it to a microSD card with dd (Linux) or Win32DiskImager (Windows). Time to connect the board. I’ve inserted by Debian SD card, and connected a USB keyboard, the serial to USB adapter I use with the Mele A1000 to UART1, a VGA cable to my monitor and a power supply to the microUSB port. Everything looks fine, I can see U-Boot and the kernel output in putty and the VGA monitors light, but the boots take over 2 minutes, as it’s stuck in udev, as it apparently tries to find another USB host that does not exists, and times out after 120 seconds. If you want to use LCD instead of VGA, the script files to do so are in script_GPIO_LCD_800x480 directory in the FAT partition of the microSD card. If you prefer to build u-boot & the kernel yourself, and use your own rootfs, you can follow the instructions in Building bootable SD-card with Debian Linux Image for A13-OLinuXino. Those are the instructions for A13-OLinuXino, so you may have to adapt the instructions for A13-OLinuXino-MICRO. This will create an image for A13-OLinuXino board (512MB RAM), and if you try directly the system will crash at boot time. So until a13_olinuxino-micro_hwpack.tar.xz becomes available, you’ll need to copy the script.bin file from the Debian image to the FAT partition. You can get hardware and software support on Olimex Forums and consult A13-OLinuXino-MICRO Wiki (In construction). If you are modifying the the kernel or u-boot source code or find bugs related to the kernel/u-boot, contacting sunxi-linux mailing-list may be a better option. If I just look at the board specifications and compare it to other low cost boards such as the Raspberry Pi or Cubieboard, Olimex A13-OLinuXino may not look the best value at 35 Euro + shipping, and Debian is not really stable on this board right now, although I’m pretty sure it will eventually be. Finally, all Olimex boards are open source hardware, which means you’ll get access to hardware design files (and not only PDF) and source code, which is not fully the case for most other boards, especially for the schematics in original format and PCB layout.